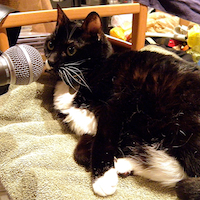 And for our next episode, this wacky word-pairing game continues as we go from Cat to…Fight! Look out, it’s a catfight! Okay, start racking your brains for your favorite Fight songs. Got a couple good ones? Tell us! Send us e-mail to the address shown at right, post a comment here on the blog, or hit the “Call Me!” button at right to leave us a message! Episode #68: the Return of the Aquabats! We listened to the show in the car yesterday, and I was just laughing out loud at the Aquabats song. Again. I just found that there was a new ThemeLounge; I guess I missed the twitter/facebook posts. Sorry, I am downloading as I type! So good to hear Aquabats again! Thanks, Ian!